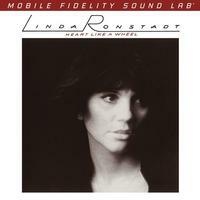 Heart Like A Wheel, Linda Ronstadt's 1974 breakthrough! How to put the ageless appeal, artistic splendor, and imaginative instrumental variety of Linda Ronstadt's Heart Like a Wheel in proper perspective more than four decades after its original release? For starters, the 1974 landmark earned three major Grammy nominations and won for Best Country Vocal Performance — Female. But that feat pales in comparison to what the record did for Ronstadt, who became the decade's most in-demand, multifaceted, and cherished female singer soon after it captured the public's attention. Or the fact that it remains a paragon of songwriting, arrangement, and performance — a trifecta that still holds sway in this era or any. Mastered on our Mobile Fidelity's renowned mastering system, this Hybrid SACD presents Heart Like a Wheel with astounding clarity, depth, and naturalism. Still the most difficult instrument to accurately capture, the female voice is here conveyed with transfixing realism, warmth, and feeling. The inner beauty of Ronstadt's flawless phrasing and passionate inflections bears out with obvious candor, her tonality and emotiveness pouring through every lyric and wordless expression. While Ronstadt's interpretive skills and stunning vocals remain front and center, the all-star cast of California-based musicians that helped transform Heart Like a Wheel into a 1970s mainstream pop-rock staple — and a lasting example of the period's laid-back West Coast sound — cannot be forgotten. Glenn Frey, Don Henley, Emmylou Harris, Maria Muldaur, Herb Pedersen, David Lindley, J.D. Souther, and Andrew Gold are just a few of the luminaries that ensure the Billboard chart-topping set rests on an unassailable foundation. This is a very good sounding SACD of this album. Clearly superior to the CD release. Clean with good instrument depth and separation. If there is anything holding this release back it is a limited frequency range / clarity on the vocals. This is less notable on some songs like "When Will I be Loved." Rondstadt and her band were in prime form for this album and there are lots of great songs here. If you like the music this is worth buying.